Please see the attached, I just wanted to share our story with you and your Facebook followers. Ntokozo was having great difficulty reading and spelling and this affected his confidence and left me helpless because I didn’t know what to do. Sometimes I became angry at myself, feeling that I have disappointed him and I would ask myself, when will this ever end. Ntokozo got promoted from grade 1 and he repeated grade 2, which I was expecting. I was always looking at the internet to see if I could find help from other parents who are having the same issues as me, because he was already having extra classes and attended a Saturday school but we did not see any improvements. As I was browsing the internet some woman mentioned Edublox and this was a turning point for Ntokozo. He started Saturday classes in January 2015 and we noticed a difference with his writing and reading. 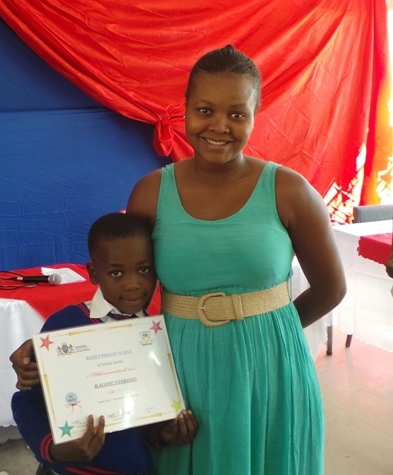 We still have a long way to go, but yesterday at price giving Ntokozo received the Most Improved Learner Award and I am so proud of him. Thank you Edublox, for your assistance and we are looking forward to next year.